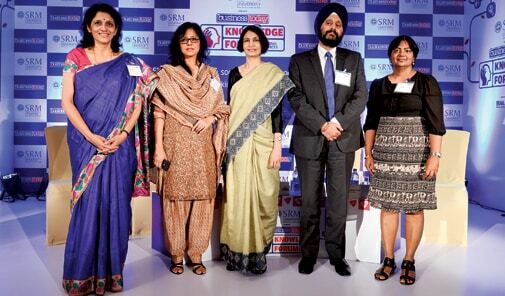 Bangalore's notorious traffic jams didn't prove to be a dampener when some of the city's sharpest, most opinionated and experienced HR practitioners came together for the Business Today Knowledge Forum on Human Resources recently. Held at Vivanta by Taj, Whitefield, the event, which witnessed two lively panel discussions, was moderated by Shamni Pande, Senior Editor at BT. The first set of panellists, comprising Elango R., Chief HR Officer (CHRO) and head of Emerging Geographies, Mphasis; Gautam Ghosh, Director, Talent Branding, Flipkart; Kris Lakshmikanth, Founder CEO and Managing Director, Headhunters India; Shilpa Vaid, Chief HR and Corporate Responsibility Officer, Bharti AXA General Insurance; and Vijayaraghavan, General Manager, HR and Shared Services, Stempeutics Research, discussed How social media is changing the workplace. Headhunters' Lakshmikanth pointed out how initially technology companies restricted employee access to external email services providers like Google and Yahoo! "However, this is the millennial generation and it is accustomed to spending time on social media platforms like Facebook, Twitter, etc. So, companies have been forced to open up and allow at least some degree of freedom, otherwise talent flees." 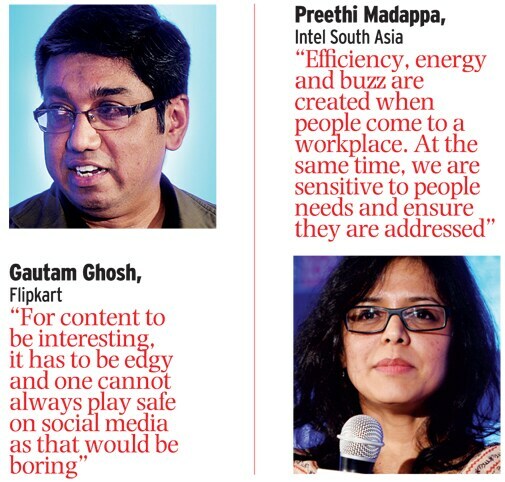 Flipkart's Ghosh made a stark point about access restrictions becoming increasingly irrelevant. Pointing out that 60 per cent of his company's sales came from mobile, he said: "Desktop is no longer the only access point. Social media is so ubiquitous that everyone is feeling its impact... It has equalised the power between individuals and institutions. For content to be interesting, it has to be edgy, and one cannot always play safe on social media as that would be boring." Elango of Mphasis felt that social media was also beneficial to organisations as it eliminated the middleman and reduced the cost of reaching out to individuals. "When we are looking to hire, I don't have to take out full-page advertisements in publications. Earlier, we used to hire 60 per cent of our people through consultants, now it is 20 per cent. Our cost of hiring has gone down by 46 per cent as I can track talent brand index on a real-time basis. We do social media audits when we hire at senior levels and because of social media I have more data to analyse whether we are hiring a loose cannon. Also, potential employees are more influenced by what is being said about the company on social media platforms by their peers." 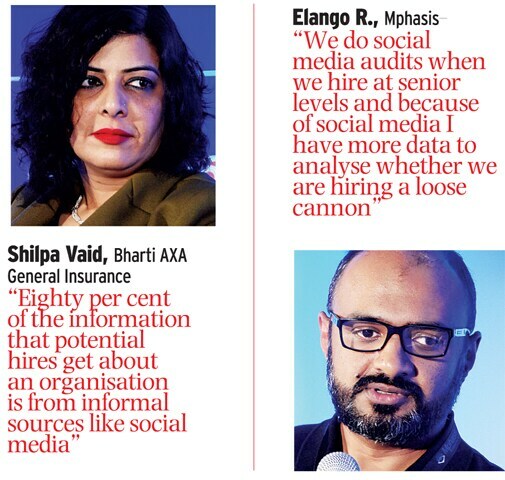 Eighty per cent of the information that potential hires get about an organisation is from informal sources, with social media being the highest, averred Vaid of Bharti AXA. If not handled well, Vaid felt that social media could also have a negative impact. Companies need to learn and practice best practices, she added. Vijayaraghavan, whose company Stempeutics works at the cutting edge of stem cell research, said that given the kind of personnel his company recruits - mostly highly accomplished doctors, scientists and researchers - having social media access and use was a hygiene issue. A representative of Happiest Minds Technologies in the audience asked the panel whether social media was 'the' core determinant of workplace dynamics today. The panel felt that while it was one of the important determinants, it was not necessarily the only one. The second panel had an ever-popular topic for discussion: Whether working from home increased productivity. 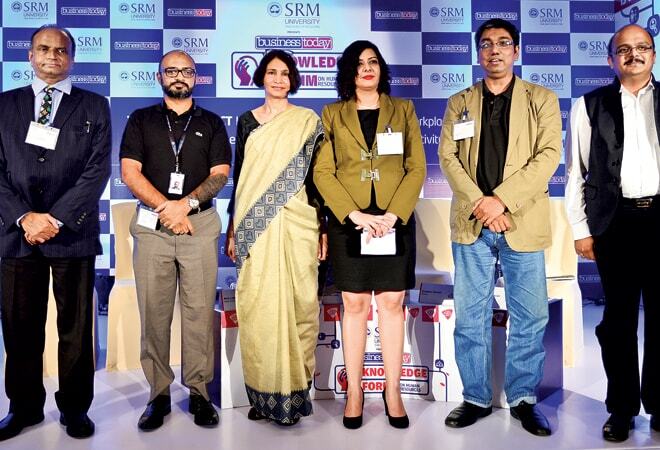 The panellists included Jagjit Singh, Human Capital Leader, PwC India; Jessie Paul, CEO, Paul Writer; Preethi Madappa, Director, HR, Intel South Asia; and Meena Ganesh, Co-founder and CEO, Portea Medical. Paul of Paul Writer, a marketing advisory services firm, began her argument by strongly disagreeing with the topic. "On average, Indian homes have more people. There is no structured environment at home. While not commuting is a major plus in the India context, unless infrastructure is there, working from home doesn't necessarily improve productivity." PwC's Singh, on the other hand, said that his company had travelled a long way in enabling people who wanted to work from home to do so. "It is all role-based. If it is a client-facing role then obviously there are some constraints but on the whole, where it is feasible and possible, we provide that opportunity. This has worked out well for us." Intel, a core technology company where innovation is a part of life, felt that the ability to interact and share ideas was best done when people worked together and not remotely, said Madappa. "Efficiency, energy and buzz are created when people come to a workplace. At the same time, we are sensitive to people needs and we ensure that (depending on needs) they are addressed." Having worked at large companies and also having hand-held numerous start-ups, serial entrepreneur Ganesh of Portea Medical, a provider of in-home health-care services, brought a fresh perspective to the topic. "In start-ups, it is crucial to have people together. But in unique cases, like our previous start-up Tutorvista, the model was such that people worked remotely from home. So, it depends on a case to case basis." Unlike conventional wisdom, Madappa felt that the newer, younger workforce, while being extremely technology savvy, realised that their growth is better served by being present at a workplace. Paul felt presence at workplace ensures culture transmission, while putting structured mechanisms in place could monitor productivity.